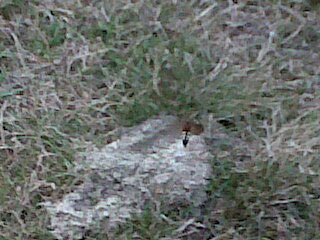 I have a number of burrows in my front yard/lawn. Unfortunately, I didn't see your article on how passive these creatures are. I have sprayed and killed many. Also, I'm confused as there are no cicadas in Hopkinton, to my knowledge. I need to mow the lawn and have two small children, so this is very concerning. I have likely killed 20+ as there are quite a few. Yes you can mow your lawn. The females will just re-excavate the burrows. Its just the females that make the burrows and yes those are cicada killers. Unfortunately if you're pretty sure you killed them all then maybe you won't have a problem. However, if females brought in cicadas, then chances are they laid eggs already on the paralyzed cicadas in the burrows. So next year you will be seeing the offspring from this year's cicada killers. I already responded to your other message as well asking for a photo, I see you attached one here so just to confirm, yes these were cicada killers. A harmless wasp but most people do not know that.